Fingerprint Cards, Sveriges nästa storbolag. : Latest Xiaomi Mi5 leak includes fingerprint scanner. Latest Xiaomi Mi5 leak includes fingerprint scanner. As Xiaomi is expected to kick off 2015 with the unveiling of a new phone, we seem to be receiving leaked photos of the Xiaomi Mi5 almost daily. On Tuesday, we passed along a photo that allegedly showed Xiaomi's next flagship handset in black. This morning, we not only have a new photo that reportedly shows the Mi5 in white, we also have some news about a feature that is rumored to be inside the Mi5. According to a new report published on Wednesday, the Xiaomi Mi5 will include a fingerprint scanner that will be built in to the home button on the handset. Hey, Xiaomi isn't known as the Chinese version of Apple for no reason! Of course, this is similar to the Touch ID feature used on the Apple iPhone. With all of the leaks and rumors, we suggest taking this with a grain of salt. Especially since each leak of the Xiaomi Mi5 that we have received over the last three days, looks completely different from each other. 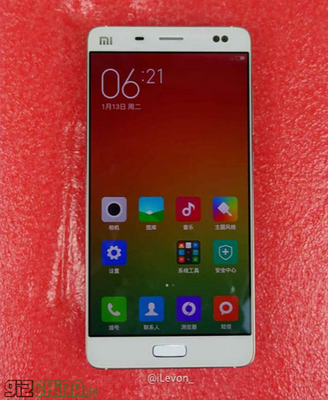 The Xiaomi Mi5 is believed to be a large screened device, possibly in the range of 5.5-inches to 5.7-inches. We could see Xiaomi take the wrapping off of the phone as soon as next week at CES. The upstart manufacturer, recently valued at a whopping $45 billion, still has yet to break into the U.S.market. Hmm. A powerfully spec'd phablet at a great price just might be the device Xiaomi needs to get a piece of the U.S. smartphone market.